A cursory glance at any mall food court is enough to demonstrate two inescapable realities, and I’m afraid to say it’s something of a good-news-bad-news situation. First off, it’s clear that our interest in food has become increasingly global. Certainly some regions of the world are over-represented and others under, but at least where I live, you can expect to find Greek, Vietnamese, Chinese, Indian, Japanese, Mexican, and of course American food, albeit in fast-foodified versions. The lineup might vary, but the point is that our interest in food has broadened considerably over the past few decades. That’s the good news part of the equation. The second reality is a little bit less sunny, and you probably have a sense of where I’m going with this. Even putting aside the food-court fare, which is after all not exactly the paragon of fine-dining, many of these complex and diverse food cultures have been distilled down to a handful of dishes (some of which are practically caricatures of the originals), repeated ad nauseum to cater to Western tastes. I’m not here to whine about differences in tastes, nor am I interested in going on an anti-Western-cuisine diatribe. Tastes in food vary across the globe, and everyone, everywhere adapts ‘foreign’ dishes to local tastes. It’s not a purely western thing either; look no further than the Japanese take on pizza if you want to see just how global this adaptive tendency can be (or if you want to horrify an Italian friend). Tastes are slow to change, but we are seeing a growing interest in authentic* cuisine in North America and elsewhere, and we can probably thank heavily adapted ‘ethnic’ food for acting as a stepping stone. It’s not really the way the dishes have been modified that bothers me – what really gets to me is the lack of diversity. Once a single dish becomes firmly ensconced in our collective culinary unconscious, we tend to resist changing it, or even venturing into related territory. When it comes to the foods we know well, we’re generally quite comfortable with variation and adaptation. Variety is the spice of life and all that. But for whatever reason – perhaps unfamiliarity, perhaps a fear of ruining or watering down an original – we tend to crystallize our idea of an ‘exotic’ food, leaving us stuck with only a tiny fraction of the flavours we could be exploring. Goma-ae (sometimes written as gomae, but I prefer the hyphenated spelling as it emphasizes the correct pronunciation) is a simple side made with lightly-cooked green vegetables and a sesame dressing, and it’s one of the most commonly encountered items on any Japanese menu in North America. Perhaps this is because it’s easy to make, or because it stands in as the token ‘salad’ amidst a sea of sushi – regardless, it’s easy to find and easy to enjoy. But goma-ae is one of those foods that’s come to mean one very specific thing to many of us, despite the fact that it can be prepared in an enormous number of ways. What we usually see on menus here is horenso-no-goma-ae (菠薐草の胡麻和え), or spinach goma-ae. The sauce itself usually features sesame paste (or at the very least sesame seeds), though it’s often prepared with peanut butter here. I’m not really sure how that got started, but hey, whatever floats your sushi boat. And you know what? It’s tasty. It’s a delicious, simple way to eat leafy greens. But it doesn’t have to be the only way. Let’s start with the greens. Spinach is a very popular green vegetable in Japan – they’re the third largest producer of it in the world, which is kind of incredible when you consider how little arable land Japan actually has. So it shouldn’t come as any surprise that spinach goma-ae is also quite popular. But there’s really nothing special about spinach that makes it uniquely suited to being dressed with sesame, and any number of leafy greens could stand in for it. As for the dressing, it can be tweaked and modified in all kinds of ways, and you’ll find plenty of variations that range from the ultra-simple to relatively complex. Now, I obviously didn’t use spinach here. In fact, I went in a decidedly different direction by using a very different and very distinctive green vegetable. Chrysanthemum greens (called shungiku in Japanese) are not very well known in North America, but they’re quite popular in most of East Asia, and very common in Japanese soups and hot pots. They have a fairly strong, slightly sweet, somewhat grassy/herbal flavour that tends to set them apart from other greens (older and larger stalks tend to stronger and more bitter). The sauce has been tweaked to match the strength of the greens, and given some extra body in order to make the whole thing a little more substantial. In addition to the sesame, I’ve added mild and sweet white miso and a little bit of tofu. The final dish is still a great, simple side, but it’s different and distinctive. It’s interesting enough to eat on its own, and bold enough to work with a flavourful main. Spinach goma-ae is still a classic (if you’re looking for a great recipe, check out this one at Norecipes.com). When you think about it, many of the culinary mainstays that have become staples in our global-food repertoire ended up their for just that reason. But there’s no reason to stop exploring, and the best place to do that is in your own kitchen. The trick is to step away from what you know and what you expect so that you can discover the recipes and foods that didn’t make it through the cultural bottleneck. But to be clear, this isn’t about being different for sake of being different. Genuinely wonderful and amazing foods are often poorly known for mundane, seemingly random reasons; an ingredient might have been uncommon, a region of the world might have been under-represented by immigration, or a dish might simply have suffered from trends and changing tastes. Keep making your favourites – but don’t be shy about switching it up. You might end up with a new favourite. *The term ‘authentic’ gets tossed around a lot, and honestly it’s starting to become something of a nuisance. Authenticity is often distorted into a caricature in much the same way that westernized food-court fare is, with only one version being deemed the ‘one true dish.’ The cuisine of a country or region is almost invariably complex, and the idea that something can only be made in one highly specific way is nonsense at best. But honestly, that’s a rant for another day. This all comes together very easily, but there are a few little tips that will help to make it a great dish. First and foremost, make sure not to overcook the chrysanthemum greens. They need to be blanched only for 45 seconds or so (even less if you have particularly small, young, or tender greens). Choose the best quality white (shiro) miso that you can find. Miso pastes vary enormously in both taste and quality, so make sure to do a little research. A good miso can be used for all kinds of dishes, so don’t be afraid to pay a little bit more for the best you can find. I used a pure sesame paste (which is easy enough to find in either Asian grocery stores or Middle-Eastern ones), but if you can’t find one, you can grind about 2.5 tbsp of sesame seeds in a small food processor or Japanese suribachi. If you go this way, try adding a little of the tamari or the rice vinegar to the mix to help you grind the paste more easily. GOOD NEWS:Low in calories, relatively high in protein, and fairly nutrient-dense, this is a flavourful and very healthy side dish. BAD NEWS:Tamari and miso make for a fair bit of salt. Try not to pair this with an overly salty main dish. Combine the tofu, sesame paste, miso, rice vinegar, and tamari in a small bowl. Mix thoroughly to form a thick paste. Bring a large pot of lightly salted water to a boil, then add the chrysanthemum greens and blanch for 1 minute, or until the greens are fairly soft but still a deep, vibrant green. Drain the greens well and rinse thoroughly with cold water to stop them from cooking any further. Once the greens are cool, allow them to drain for a few minutes, then use your hands to gently squeeze any excess water out of them. Lay the greens out on a cutting board and cut them into 3-4 inch (7-10 cm) pieces. Combine the greens and the sauce in a large bowl. Serve, (chilled or at room temperature). garnished with sesame seeds. Made this tonight and it was delicious. Great way to use the chrysanthemum greens! Very interesting! I’ve never used or knew that we could eat chrysanthemum greens! I have no idea where I might even find this. Your beginning points reminded me of when we went to China over a decade ago, and some people in our group were so disappointed with the “Chinese food”. haha They were expecting the same as in North America. They’re one of the more overlooked Asian greens to be sure. I admittedly live in a part of Canada with a huge East Asian population, so they’re pretty common here, but in general you can find them at well stocked Chinese and Korean grocery stores – especially those with a good green/produce section. 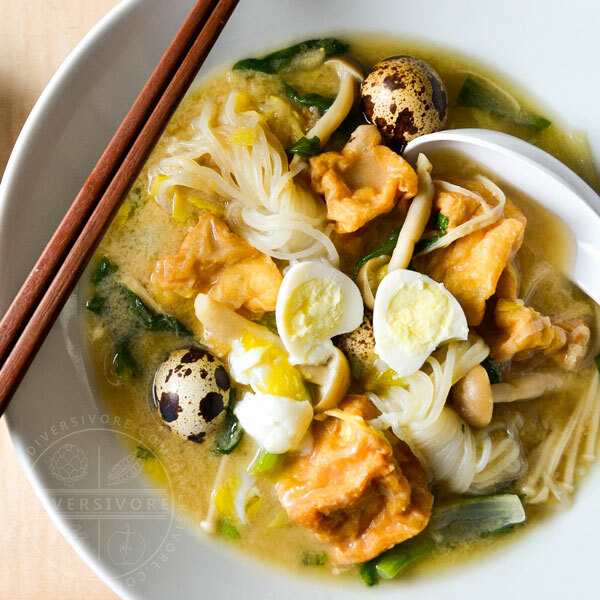 While I used the Japanese name in this recipe, you’ll generally find it sold as Tong-ho (or something close to that spelling), which is the Cantonese name. If you’re looking for more info, there’s plenty in the Ingredient Page here. I’m sure that MANY an American/Canadian has been shocked by the Chinese food in China. Frankly the average Chinese restaurant doesn’t do much to represent the cuisine of China on the whole. It’s a shame really, because I personally think that there are some truly incredible dishes and flavours that are underrepresented here in the West. Hopefully a few members of your group had their eyes opened to the possibilities! I love a good miso sauce, and can’t wait to give yours a try! Curious, what’s the purpose of the tofu? To add body? I couldn’t agree with you more. Miso can do some pretty spectacular things, and it makes for some outrageously good sauces. And yes, you’re bang-on about the tofu – it adds body and protein to the recipe. You could probably omit it to make a slightly thinner dressing, but I think it also helps to mellow out the somewhat intense flavour of the chrysanthemum greens. I love goma-ae salad, mainly because I love the sesame dressing. To me, the fun of cooking or baking is to explore new ingredients and flavour. We are so lucky that we can taste so many different cuisines in Canada. People who are narrow minded just don’t know what they are missing out !! Thanks for sharing your recipe ! I totally agree with you Vicky. Sesame is a pretty addictive flavour – there’s really nothing quite like it. And I’m with you on the exploring (I’m sure you’re not surprised to hear that). It’s an adventure, and frankly I can’t imagine not wanting to dive in! Hopefully posts like this will help open a few minds along the way too. It’s a big world and it’s worth seeing what it has to offer. Thanks for commenting.